1. Fed rates decision: The US Federal Reserve is expected to raise its benchmark interest rate by a quarter of a percentage point for the third time this year, to a range of 2% to 2.25%. If it happens, it will be he eighth hike since late 2015. Four more moves before the end of 2019 may be in the cards. At the same time, the Fed is trimming its $4.5 trillion balance sheet — an experiment that could contribute to higher borrowing costs as foreign central banks follow suit and unload bonds. Investors want to hear more about how the central bank is contending with risks to economic growth, including the ballooning trade war and rising oil prices. 2. Nike fails to convince investors: Shares in Nike (NKE) were poised to open lower after the company released earnings on Tuesday. Nike reported double-digit growth in sneaker and clothing sales, digital sales and profit in the second quarter compared with the same time last year. But that still wasn't enough to impress investors. Shares in Nike have climbed about 36% this year. 3. New leader at Daimler: German carmaker Daimler (DDAIF) has announced its succession plan. Ola Källenius will replace Dieter Zetsche as chief executive and head of Mercedes Benz in 2019. Källenius has been in charge of the company's research and development since 2017, and was widely seen as a possible successor to Zetsche. Zetsche won't going away, however: Shareholders will be asked to make him chairman of the carmaker's Supervisory Board starting in 2021. 4. Global market overview: US stock futures were higher. European markets dropped in early trading, while stocks in Asia closed mostly higher. The Dow Jones industrial average closed 0.3% lower on Tuesday, while the S&P 500 dropped 0.1%. 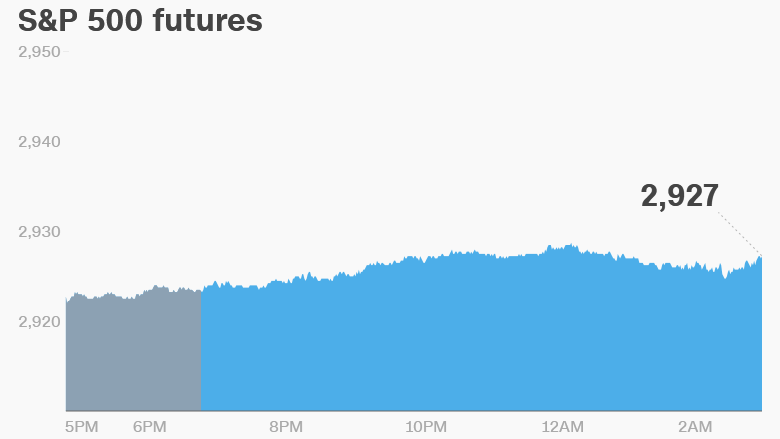 The Nasdaq gained 1.2%. 5. Earnings and economics: CarMax (KMX) will release earnings before the open. Bed Bath & Beyond (BBBY) is will follow after the close. Shares in GE (GE) fell 4% on Tuesday to a nine-year low after French energy company EDF reportedly shut down a GE turbine at one of its power plants. The US Census Bureau plans to release report on new home sales in August at 10:00 a.m. ET. A weekly report on US crude inventories will be released at 10:30 a.m. ET. Shares in Nissan (NSANF) dropped 4.1% in Tokyo after the company admitted it had "extremely low awareness" about testing of emissions. The carmaker acknowledged irregularities relating to emissions tests earlier this year.